CSA stands for Community Supported Agriculture. 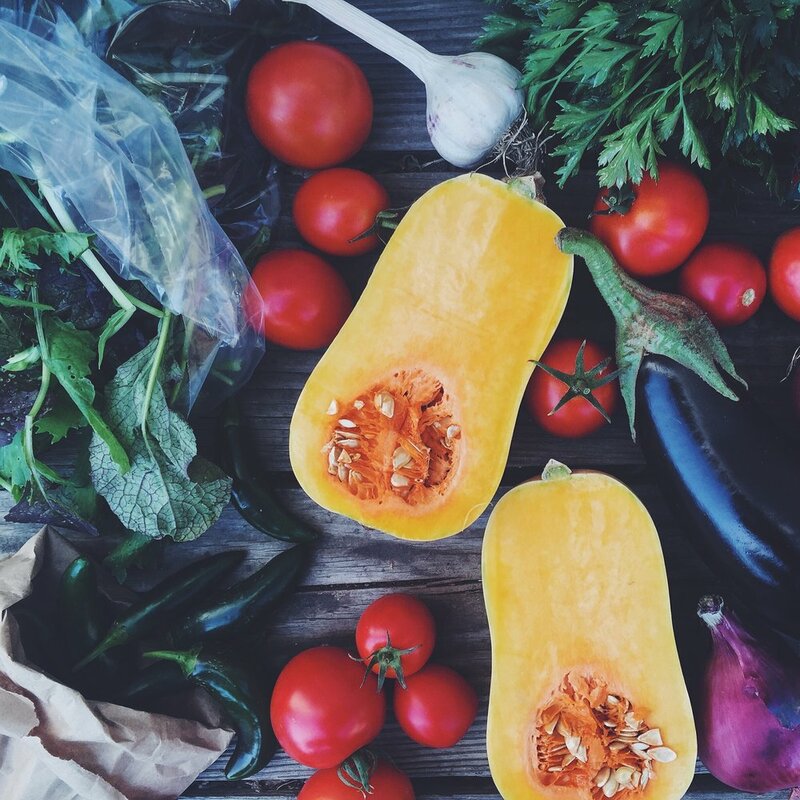 Its the perfect way to support local farms and eat amazing seasonal produce. Big changes are coming our way in 2018 (both on and off the farm). We're expecting our first baby in February and we will be making some modifications to our csa model. Welcome the Happy Acre FARM CARD! This year our 'Drop Sites' will be our farmers markets, and pick up days will be on Sundays. 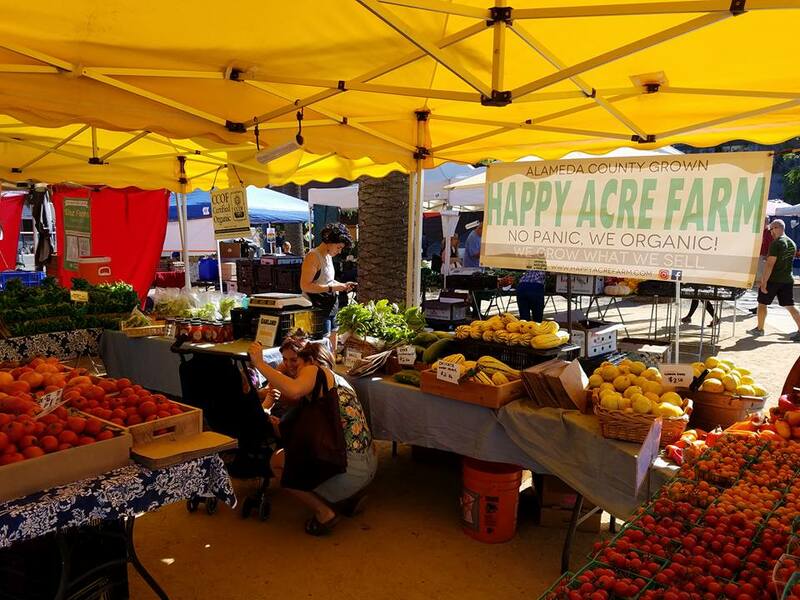 *Markets currently are the Pleasanton Farmers Market on Saturday & the Jack London Farmers Markets on Sunday. csa members can purchase a $300 - $500 share at the beginning of the season (see below for more details) which you can spend like cash throughout the season at the farmers markets. 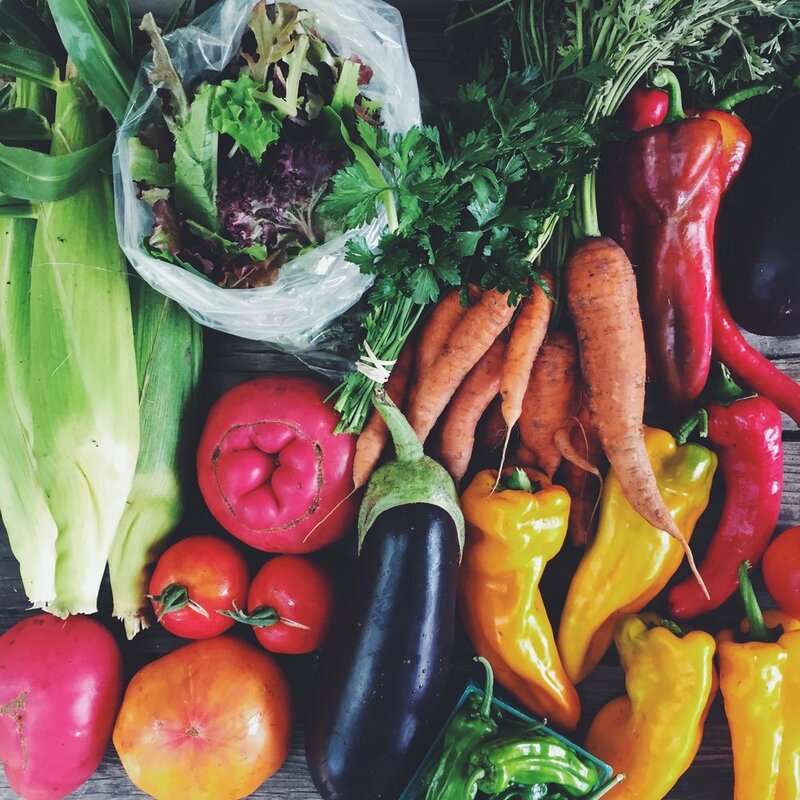 You pick out your own produce - as much or as little as you like - over the course of the season, and we subtract your weekly selections from your credit balance. There are approximately 28 weeks in our market season, so if you purchase a $300 share, that is equivalent to buying about $10.75 a week of produce. You can add more to your balance if you use it all before the end of the season. Any share balances at the end of the season will be donated in produce to our local food bank. Benefits of a Farm Card: The biggest Benefits are FLEXIBILITY & Directly supporting a small farm. As a member you have the ability to pick whatever you like, every week. Don't like beets? Skip 'em. craving kale? grab as many bunches as you want. Need A flat of tomatoes for canning? No problem, take it. Having a dinner party? Pick up everything you'll need at our stand. Going on vacation? No more skipping boxes, or arranging for someone else to pick them up for you. Enjoy your time away, Your balance will be waiting for you when you return. CSA is no longer limited to just produce - get down on some of our value added products; canned tomatoes, salsa, tomato juice, dried tomatoes and olive oil. Less Stress. No more worrying about bringing back the boxes to drop sites, or being able to pick up your share on time - you don't even need to think about bringing cash. just come and enjoy yourself! We will still be sending out weekly newsletters full of recipes and what to expect at our markets that weekend. In addition, you will usually see one of us (the farmers and the baby) at each market, and we can answer any question you might have, recommend a new vegetable, a recipe, or just talk about the farm. By purchasing a share you are investing in the success of the farm, enabling us to make vital purchase (seeds, compost, etc.) before the season begins. We offer 3 different shares to help you buy the membership best suited to your needs. We encourage you to inquire regularly about your balance to help you gauge your use. $300 - This averages out to about $10.75/market. Sign up before March 1 and receive an additional $10 credit. $400 - this averages out to about $13.75/Market. Sign up before March 1 and receive an additional $15 credit. $500 - this averages out to about $18/market. Sign up before March 1 and receive an additional $20 credit. You can pay in full, or pay half now and the other half by May 15.